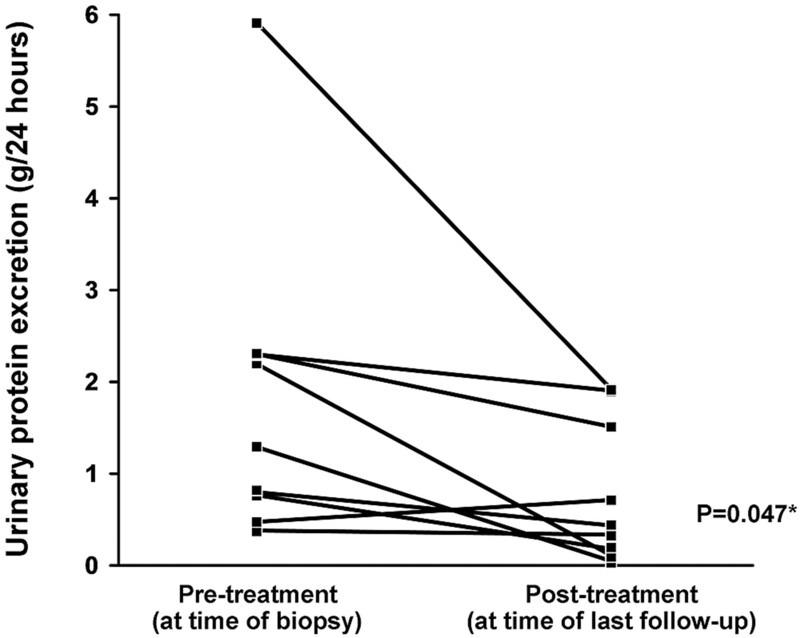 Background & objectives: Renal pathology and clinical outcomes in patients with primary Sjögren's syndrome (pSS) who underwent kidney biopsy (KB) because of renal impairment are reported. Design, setting, participants, & measurements: Twenty-four of 7276 patients with pSS underwent KB over 40 years. Patient cases were reviewed by a renal pathologist, nephrologist, and rheumatologist. Presentation, laboratory findings, renal pathology, initial treatment, and therapeutic response were noted. 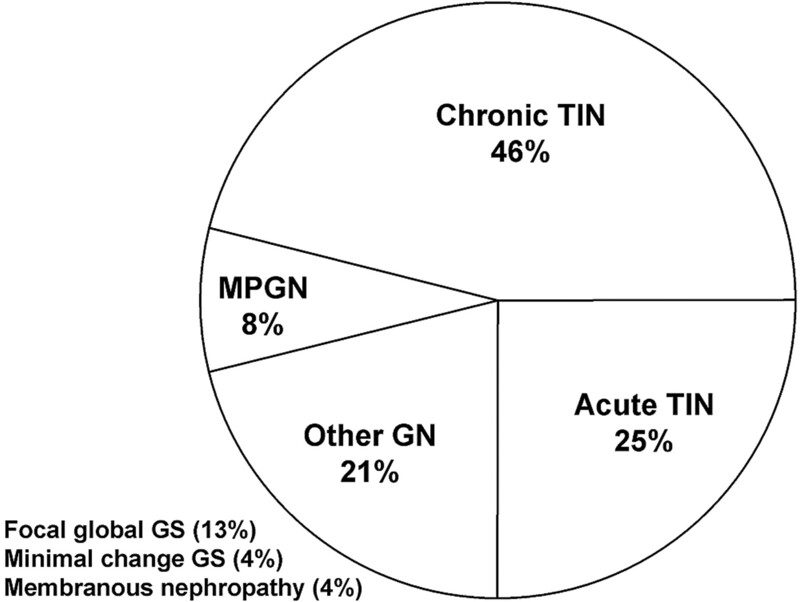 Results: Seventeen patients (17 of 24; 71%) had acute or chronic tubulointerstitial nephritis (TIN) as the primary lesion, with chronic TIN (11 of 17; 65%) the most common presentation. Two had cryoglobulinemic GN. Two had focal segmental glomerulosclerosis. Twenty patients (83%) were initially treated with corticosteroids. In addition, three received rituximab during follow-up. Sixteen were followed after biopsy for more than 12 mo (median 76 mo; range 17 to 192), and 14 of 16 maintained or improved renal function through follow-up. Of the seven patients presenting in stage IV chronic kidney disease, none progressed to stage V with treatment. Conclusions: This case series supports chronic TIN as the predominant KB finding in patients with renal involvement from pSS and illustrates diverse glomerular lesions. KB should be considered in the clinical evaluation of kidney dysfunction in pSS. Treatment with glucocorticoids or other immunosuppressive agents appears to slow progression of renal disease. Screening for renal involvement in pSS should include urinalysis, serum creatinine, and KB where indicated. KB with characteristic findings (TIN) should be considered as an additional supportive criterion to the classification criteria for pSS because it may affect management and renal outcome. Primary Sjögren's syndrome (pSS) is a progressive autoimmune disorder involving the exocrine glands ( 1), typically presenting with keratoconjunctivitis and xerostomia ( 2). It is characterized pathologically by a predominant lymphocytic infiltrate around epithelial ducts of exocrine glands on salivary gland biopsy ( 3). Extraglandular manifestations of pSS, once thought to be uncommon, occur in up to 25% of patients. Patients can be afflicted by severe interstitial lung disease ( 4), cutaneous vasculitis ( 5), peripheral neuropathy ( 6), and hematologic complications such as lymphoma ( 7). They are also at increased risk for celiac sprue ( 8) and complications from Helicobacter pylori infection ( 9) such as mucosa-associated lymphatic tissue (MALT)-type lymphoma. Much of our understanding of the clinical presentation of renal involvement in pSS is based on case reports ( 10 – 26) and small retrospective cohorts ( 27 – 29). Tubulointerstitial nephritis (TIN) remains the most common presentation of renal involvement in pSS and CD4/CD8 T cell subsets are reported to predominate ( 27, 30). This is often characterized by a distal (type I) renal tubular acidosis (RTA) and less commonly proximal (type II) RTA (Fanconi syndrome) ( 11, 31 – 33). GN is thought to be a rare occurrence, with only case reports available in the literature ( 10, 12 – 23), and tends to be a late development ( 34) in the course of the disease. We examined the renal pathologic findings and clinical trends of all patients with pSS who underwent kidney biopsy (KB) at Mayo Clinic since 1967 and assembled a case series of patients with pSS with renal pathologic disease evaluated by renal biopsy at a single center in the United States. This case series aimed to describe the common clinical presentations of renal disease in pSS, the array of pathologic findings of renal involvement in pSS, and trends during follow-up and treatment. After institutional review board approval, a comprehensive search of the electronic medical record of Mayo Clinic in Rochester, Minnesota from 1967 to 2007 was performed to identify patients with the diagnosis of pSS utilizing the HICD-A code 07162-12 for this case series. Over this 30-yr time frame, 7276 patients were identified. 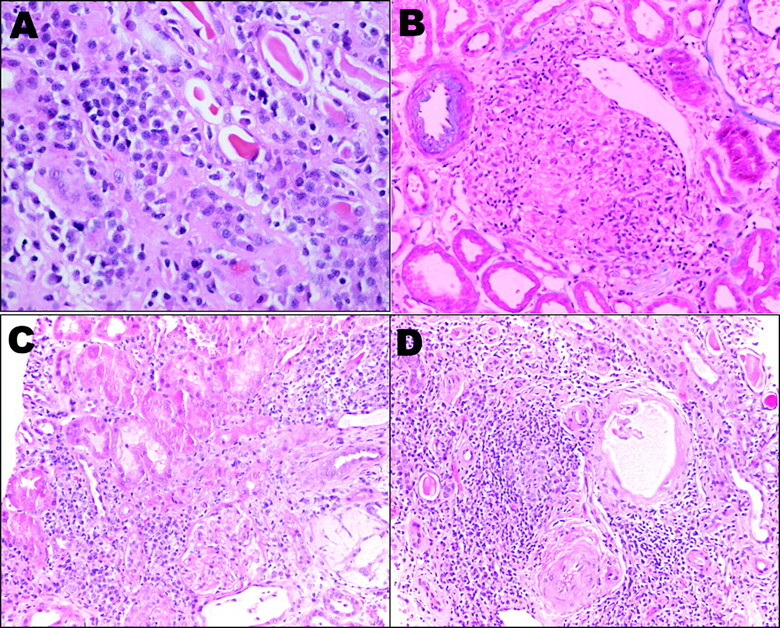 A computer-aided cross match was performed with the renal biopsy database, identifying patients who shared the coded diagnosis of pSS and underwent renal biopsy during this time period. (6) Presence of autoantibodies to Sjögren's syndrome-associated antigen A [SSA (Ro)] and Sjögren's syndrome-associated antigen B [SSB (La)]. A limitation to the retrospective use of classification criteria in this series was most patients were referred after serologies were performed elsewhere; thus many patients did not undergo additional testing at the time of consultation. Also, routine SSA and SSB testing in patients were only available after 1990. Rheumatoid factor and hypergammaglobulinemia were felt to be reasonable surrogates when SSA and SSB testing were absent. All patients were determined to have pSS by a board-certified rheumatologist before renal biopsy. A board certified rheumatologist independently reviewed all patients retrospectively before inclusion. Therefore, the primary inclusion criterion for this case series was a consensus diagnosis as established by the initial consulting rheumatologist and subsequent confirmation and classification by an independent rheumatologist. The number of classification criteria satisfied by each patient through chart review is displayed in Table 2. Patients with evidence of another connective tissue disorder or rheumatologic disease were excluded. After this rigorous review process, 24 patients with renal biopsies satisfied the inclusion criteria. The clinical presentation of renal disease was reviewed, including symptomatology, laboratory evidence of renal dysfunction (RTA defined as non anion gap metabolic acidosis with a urine pH > 5.5, proteinuria defined as >300 mg/24 h, hypocalcemia, hypokalemia), medical comorbidities (diabetes mellitus, hypertension), and estimates of renal function at the time of biopsy. Treatment modalities and response to treatment through follow-up was included, when available. KB specimens were recalled from the tissue registry for reassessment. Biopsy specimens were available for 18 of 24 patients. Four patients with a KB obtained from an outside institution were unavailable for review, but the findings from the original report were included in the tabulation of patients. A renal pathologist, nephrologist, and rheumatologist reviewed the biopsy reports of all available patients, along with pertinent clinical findings. A renal pathologist confirmed the findings contained in each biopsy report through independent review of slides. The baseline characteristics, serologies, classification criteria, and renal presenting features are summarized in Table 1. Individual findings for each patient are summarized in Table 2. Twenty-four patients with confirmed pSS underwent KB at Mayo Clinic during the period of 1967 to 2007. Of these patients, 21 (83%) were women. Dry eyes (92%) and dry mouth (79%) were the predominant clinical symptoms. Positive serologies to SSA, SSB, rheumatoid factor, or hypergammaglobulinemia were present in all patients. Six patients (25%) were not tested for SSA or SSB; all of these patients were biopsied before 1992. Hypergammaglobulinemia was the only serologic correlate of pSS in three patients. Twelve patients tested for ocular signs of pSS using a Rose Bengal score dye test or Schirmer test, and of those evaluated, 11 of 12 (92%) were consistent with keratoconjuntivitis sicca. The clinical presentation of renal disease in pSS was variable, although proteinuria and RTA were quite common as summarized in Table 1. Ten patients (42%) presented with GFRs under 30 ml/min/1.73 m2 as estimated by Modification of Diet in Renal Disease (MDRD) methodology ( 36), including one patient who had been maintained on intermittent hemodialysis before evaluation. Seven patients (29%) presented in acute renal failure, four of which had GFRs below 30 ml/min/1.73 m2. Median age at biopsy was 58 yr (range 13 to 84). In seventeen patients (71%), the primary lesion seen on KB was TIN. Mild TIN was noted in the context of a primary glomerular lesion in two other patients (patients #2 and #5). Six patients (35%) had acute TIN with active tubulitis, four of which presented with RTA. Seven patients (29%) had a primary glomerular lesion on renal biopsy, with membranoproliferative glomerulonephritis (MPGN) (n = 2) and global glomerulosclerosis (n = 2) the most common pathologic findings. Table 2 summarizes the clinical presentation and KB summary for each patient. Corresponding photomicrographs of several biopsies detailed in Table 3 are presented in Figures 1 and 2. 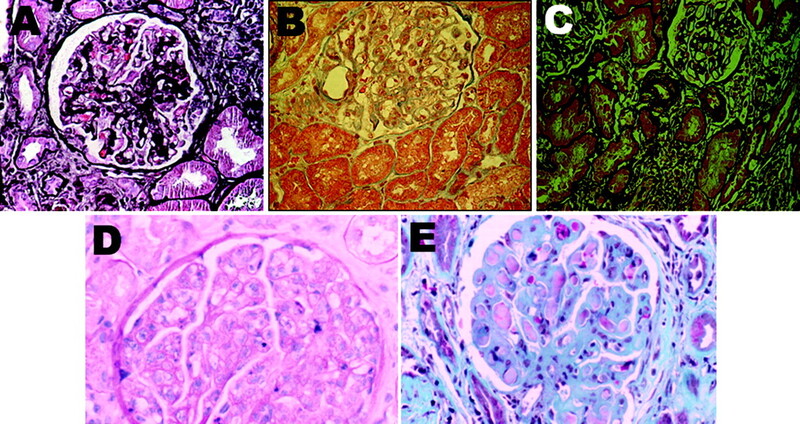 Representative microphotographs of the diverse glomerular pathology seen in pSS. (A) Healed proliferative GN and focal global and segmental glomerulosclerosis (not shown). Healed proliferative glomerular lesions consistent with prior proliferative process (silver stain). (B) Minimal-change GN (hematoxylin and eosin). (C) Membranous nephropathy with localized subepithelial deposits confirmed on electron microscopy (not shown) (silver). (D) MPGN (hematoxylin and eosin). (E) Large subendothelial deposits characteristic of cryoglobulinemic GN (trichrome stain). Magnifications: ×100. Representative microphotographs of the various tubulointersitital infiltrates in pSS. (A) Acute or chronic TIN with proteinaceous casts and atrophic tubules. (B) Granulomatous TIN. (C) Chronic TIN. (D) Chronic TIN. Magnifications: ×200 in A and B through D; ×100 (hematoxylin and eosin). Treatment and findings on follow-up are summarized in Table 2. Twenty patients (83%) were initially treated with corticosteroids. The median initial dose of prednisone was 40 mg (range 30 to 60 mg) with a median duration of 30 wk (range 4 to >52 wk). Eight patients remained on long-term corticosteriods more than 1 yr, with a median chronic dose of 5 mg (range 2.5 to 20 mg). Of the remaining four patients who did not receive prednisone, three received no immunosuppressive treatment because of the mild nature of their renal disease, and the remaining patient received plasma exchange because of cryoglobulins (patient #13). Two patients, both with TIN, received cyclophosphamide in addition to corticosteroids (patients #10 and #14). One patient received rituximab (at the time of biopsy) in addition to corticosteroids (patient #11). Only six of these patients with pSS (25%) were on treatment with hydroxychloroquine before KB. Sixteen patients were followed after biopsy for more than 12 mo; median follow-up was 76 mo (range 17 to 192 mo). Eight patients were followed for less than 6 mo after biopsy; of these five were lost to follow-up. Nine patients of those followed (56%) sustained at least a 30% improvement in GFR estimated through MDRD methodology (range 31 to 161%). Eight patients (42%), including one patient who elected to not receive corticosteroids at diagnosis, had impaired but stable renal function during the follow-up period without deterioration. Renal function deteriorated in two patients (11%) as they progressed from stage III to stage IV chronic kidney disease despite treatment. In the eight patients with RTA, only one had proximal tubular dysfunction, with the remaining patients having distal tubular dysfunction. There appeared to be minimal improvement in acidosis despite immunosuppressive therapy in patients with sufficient follow-up; however, the data for this were limited to only two patients. Both of these patients were maintained on oral bicarbonate supplementation. Of seventeen patients that received treatment with immunosuppressive agents and had more than 3 mo of follow-up, there was a statistically significant trend toward improvement in estimated GFR ( Figure 3) and degree of proteinuria ( Figure 4). Inflammatory markers were followed inconsistently; therefore it is unknown to what degree these markers improved over time. Longitudinal changes in renal function (estimated GFR) seen in patients with pSS receiving immunosuppressive therapy. Patients who received no treatment and those with insufficient follow-up of <3 mo were excluded (n = 7). *Paired t test. HC, hydroxychloroquine; C, cyclophosphamide; R, rituximab. 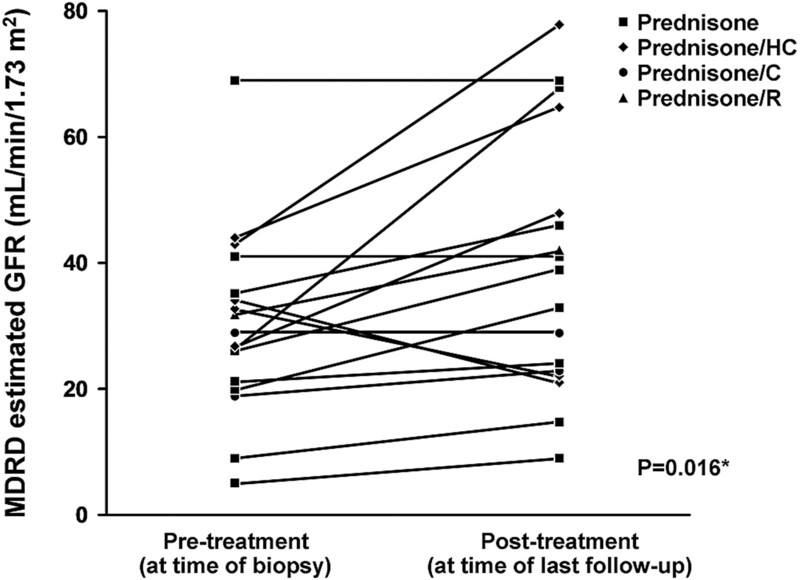 Longitudinal changes in proteinuria seen in patients with pSS receiving immunosuppressive therapy. Only patients that had protein excretion of >0.3 g/24 h at the time of biopsy and who received immunosuppressive treatment were included in this analysis. Patients who received no treatment, those with insufficient follow-up of <3 mo, and those lacking follow-up urine collections for protein measurement were excluded (n = 7 of 16). *Paired t test. There were no documented severe adverse reactions (opportunistic infections, cytopenias, lymphoproliferative disorders) attributed to immunosuppressive therapy in any patients who received treatment. One patient who underwent KB in our cohort was an adolescent girl (age 13 yr) who had presented with RTA and mild proteinuria. KB revealed TIN. Renal function remained stable on prednisone treatment throughout 28 mo of follow-up. Case reports of adolescents with pSS and renal involvement have previously described a rapid clinical progression to ESRD ( 37, 38), which fortunately did not occur in this patient. A unique case in this series was a patient (#20) who had a chronic TIN with granulomatous inflammation on renal biopsy, as seen in Figure 2B. This patient had a prior diagnosis of sarcoidosis and worsening manifestations of pSS in the setting of chronic kidney disease. She subsequently developed lymphoma during follow-up, likely related to her pSS. There is one published case report ( 26) of a patient with a similar overlap of sarcoidosis and pSS. Three patients received rituximab during the course of follow up. Two patients received the agent because of worsening sicca symptoms, whereas the third patient received the agent at the time of biopsy. Only one patient (#11) had her B cell subsets followed, which revealed significant B cell depletion that remained depleted through 26 mo of follow-up. The first of these patients (patient #4) received rituximab 11 yr after KB for worsening symptoms of pSS; this patient who had MPGN and cryoglobulins with lymphoplasmacytic lymphoma initially received corticosteroids and hydroxychloroquine to treat her pSS and renal dysfunction. She became more symptomatic with worsening dry eyes and mouth 7 yr after biopsy and was treated with rituximab. Her MPGN remains in clinical remission with normal renal function. The second (patient #11) had chronic TIN and cutaneous primary amyloidosis and received rituximab as part of her initial treatment after biopsy, with subsequent improvement in renal function by 31% (by MDRD estimation) after 25 mo of follow-up, as depicted in Table 2. The third (patient #20) received rituximab 8 yr after biopsy for worsening sicca symptoms with significant improvement. She had a prior diagnosis of sarcoidosis superimposed with pSS and granulomatous inflammation was seen on renal biopsy ( Figure 2B). She ultimately developed large cell lymphoma treated with CHOP chemotherapy. Rituximab was added to the treatment regimen approximately 8 yr after biopsy for worsening sicca symptoms with good clinical response; her creatinine and estimated GFR remained in the normal range before and after treatment. Four patients (17%) were diagnosed with lymphoma during their follow-up. The first (patient #4) originally developed diffuse B cell lymphoma several years after her diagnosis of MPGN and cryoglobulinemic GN. She was treated with CHOP chemotherapy and developed new adenopathy several years after treatment, consistent with a low-grade lymphoplasmacytic lymphoma, which has been followed. The second (patient #13) also developed a diffuse B cell lymphoma. The third (patient #17) developed a low-grade MALT lymphoma of her parotid gland. The fourth (patient #20) developed a large B cell lymphoma treated with CHOP chemotherapy with no recurrence throughout follow-up of over 10 yr. The results of this case series demonstrate and support previous evidence that patients with pSS can present with significant renal involvement of diverse etiology. Unfortunately, most of these cases went unrecognized until significant renal dysfunction occurred. This emphasizes the importance of early detection and aggressive treatment. The clinical course of the patients in our series demonstrates that the renal lesions associated with pSS can improve significantly with treatment. Chronic TIN, the classical pathologic finding in pSS, continues to be the most common underlying pathologic finding associated with renal dysfunction in pSS, followed by acute TIN. However, primary glomerular disease processes, considered rare in pSS, were also present in our patients ( Figure 5). The clinicopathologic diagnosis affected treatment decisions regarding immunomodulatory drug therapy, especially in patients with GN. Pie chart showing distribution of renal pathologic findings in the 24 patients included in this case series. The reported prevalence of renal involvement in pSS varies greatly. One cross-sectional study evaluated 60 patients with pSS for the prevalence of renal involvement ( 27). Sixteen patients (27%) were identified with frank abnormalities in their laboratory studies suggesting tubular or glomerular pathology. A second retrospective study assessed 471 patients over 10 yr of follow-up and found 20 patients (4.2%) who developed overt renal disease, of which 18 underwent renal biopsy ( 28). In our series, only 24 patients with confirmed pSS (0.3% of 7276 patients) were evaluated by KB in the time period studied, but it is unknown how many patients had clinical findings of renal dysfunction and did not undergo KB. Renal involvement in pSS is thought to be primarily a monolymphocytic TIN with rare glomerular involvement ( 39 – 41). Renal tubular dysfunction as manifested by type 1 RTA, renal calculi, and hypokalemia are also common ( 42). Because TIN historically has been associated with pSS ( 33, 43), it is certainly possible that patients with clinical evidence of renal involvement are not biopsied because of the assumption that these patients have TIN and hence are treated empirically without obtaining an accurate histopathologic diagnosis. Our series recognizes that early treatment with immunosuppressive therapy appears to maintain or improves renal function and that KB can aid in identifying patients that may respond to other treatment modalities, such as cryoglobulonemic GN. The etiology of the interstitial and glomerular findings encountered in this series were diverse and consistent with other case series in the literature. In one series, 9 of 16 patients with renal involvement from a cohort of 60 patients with pSS underwent KB ( 27). TIN was identified in six patients, MPGN in one patient, membranous nephropathy in one patient, and mesangial GN in one patient. A second series of 18 patients revealed 10 cases of TIN and 8 with various glomerular diseases, including MPGN, membranous nephropathy, and focal crescentic GN ( 28). Lastly, a recent study was published identifying a large cohort of 130 patients with renal involvement and pSS from China ( 29). Of these, 41 were biopsied over the course of 13 yr. Over 80% of those patients had TIN on biopsy with the remainder demonstrating FSGS (n = 2), membranous nephropathy (n = 1), and proliferative GN with diffuse mesangial cellular hyperplasia and matrix thickening (n = 3). Mesangial proliferative nephritis was seen in two patients. The authors also recognized a plasmacytoid lymphocytic infiltrate in patients with TIN, similar to our observation in several patients, as demonstrated in Figure 2A. Seventeen patients (71%) in this retrospective cohort received no immunomodulating therapy before biopsy. Because all patients had been diagnosed with pSS before the onset of significant renal dysfunction requiring biopsy, we question whether more aggressive systemic treatment of pSS could limit development of systemic complications. Nearly all patients in this retrospective cohort received therapy with corticosteroids after biopsy. Other medications were prescribed based on the findings of the KB. Cyclophosphamide in addition to corticosteroids was used in two patients with severe TIN and both maintained or improved renal function over time. Rituximab was used in three patients, although only one received the medication along with corticosteroids at the time of biopsy; the remainder received monotherapy during follow-up for worsening sicca-type symptoms. As demonstrated in Figures 3 and 4, we observed a statistically significant trend toward improvement in renal function and proteinuria with treatment of any kind. We suggest that all pSS patients with renal involvement should receive a course of corticosteroids as first-line treatment. The efficacy of long-term steroid-sparing immunosuppressive agents for treatment of renal disease remains largely unknown and is an area for further research. The lesions described in this series were exquisitely treatment-responsive. Although not specifically evaluated in the study presented here, we suggest that therapies may be tailored based on the KB pathology, proximal tubular urine markers, trends in measured or estimated GFR, and urine sediment, which is particularly useful in the diagnosis of and follow-up of TIN disease activity and subsequent monitoring for renal disease relapse (by quantitative leukocyturia and other components discriminating for glomerular involvement). Proximal tubular protein markers (e.g., retinol binding globulin and α1 microglobulin) are now clinically available and can be used for renal disease monitoring. Other parameters useful in longitudinal follow-up assessment include systemic clinical symptoms, monitoring of polyclonal gammopathy, and rheumatoid factor titers. Agents that specifically target the underlying mechanism for pSS may have a more central role in the long-term management of pSS with or without renal involvement. Rituximab and other B cell targeted therapies may be considered emerging therapeutic options for sicca-type symptoms and extraglandular manifestations as suggested by case reports ( 44, 45) and small retrospective cohorts ( 46). A recent prospective open-label phase II study ( 47) examined the clinical response to infusions of rituximab (4 infusions of 375 mg/m2) given weekly after pretreatment with prednisone (25 mg) in eight patients with early pSS and six patients with late pSS with MALT-type lymphoma. Both groups responded to rituximab for treatment of sicca-symptoms, suggesting that B cell targeted therapy is efficacious in the treatment of pSS with or without MALT-type lymphoma. However, this study did not report the effect of rituximab therapy on renal function. One possible limiting factor for the success of this treatment was the high incidence of human antichimeric antibodies (in four patients) that can lead to a serum-sickness-like disorder. The patients in our series demonstrated responsiveness to treatment when diagnosed before progression to ESRD, because most maintained or improved renal function after treatment during follow-up. None of the seven patients with stage IV chronic kidney disease at presentation progressed to stage V or ESRD (median follow-up 38 mo, range 3 to 192). Although no patients initiated hemodialysis after biopsy, two progressed to stage IV chronic kidney disease despite treatment during follow-up. This highlights the importance of monitoring renal function in pSS. Chronic TIN is the predominant pathologic finding identified in pSS patients who underwent renal biopsy. Diverse glomerular pathologic lesions are also seen in this disease. Because chronic TIN with monolymphocytic infiltrate is the prototypic renal lesion in pSS, we propose that a KB demonstrating these findings should also be considered as an additional supportive criterion to the classification criteria for pSS. Given the effect of progressive renal disease in patients with pSS, especially those who progress to severe renal impairment before diagnosis, greater emphasis should be placed on screening for renal involvement with a low threshold for early nephrology referral and KB.